I buy my tennis shoes from Ryka, so they send me email every once and a while. Mostly it’s just advertisements for more Ryka products, but this time, they announced a series of races they are sponsoring, Iron Girl. The nearest they come to me is Denver, so I won’t be participating in any of these triathlons, but it’s nice to know that Ryka is actually sponsoring events that have something to do with their shoes. 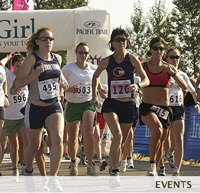 If you have been having trouble with motivation lately, try signing up for a race. I’ve found that knowing that I’m going to have to compete against other people is enough to get me out of bed and onto the treadmill every day. I feel like a wimp. As an FYI — not all of these dates are triathalons. My sister and I are signed up for the Boston date, which offers a 10K and a 5K. One cool thing about this series: if you register early enough, they print your first name on your number bib so that spectators can cheer for you by name! Yer, it is good to see a company sponsoring something that is to do with their products! – Wish they all did that!